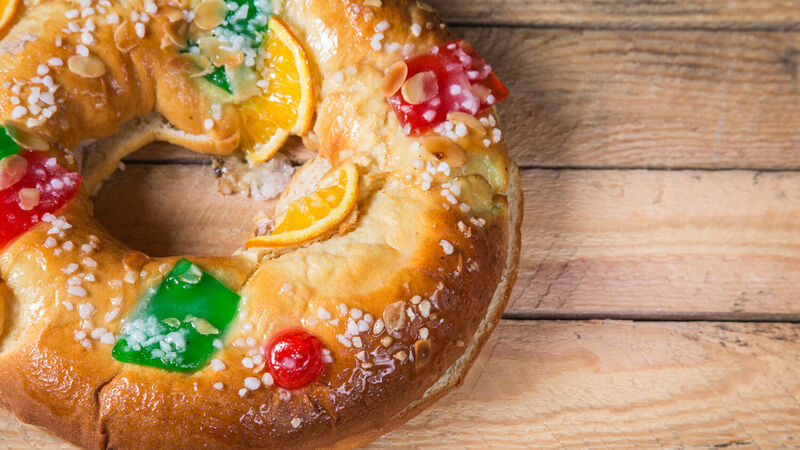 In recent days, during your visits to bakeries, supermarkets and cafés in Puerto Vallarta, you have probably seen this ring-shaped bread decorated with dried and candied fruits named Rosca de Reyes and wondered what it is. Similar to the King Cake in France and Southern US, Rosca de Reyes is a traditional sweet bread eaten on January 6 in Spain, Mexico and other Latin American countries, during the celebration of the Día de Reyes (Three Kings day or the Epiphany), commemorating the day when the three Wise Men visited Baby Jesus. The Rosca de Reyes is traditionally topped with dried fig strips, candied lemon peel slices, chopped candied cherries, and confectioner sugar and is accompanied by a delicious cup of Mexican Hot Chocolate. Hidden inside the Rosca de Reyes, there’s one or various Baby Jesus figurines, symbolizing the need of a safe place for Jesus hidden away from King Herod. When the Rosca is divided in slices, each person sharing the Rosca must inspect their slice. Traditionally in Mexico, whoever gets the figurine must bring tamales for everyone else during the celebration of the Día de la Candelaria (Candlemas) on February 2. Don’t miss the opportunity to try Rosca de Reyes, one of the most delicious sweet breads in Mexico and be a part of this beautiful tradition.